It took him eight tries, but Scott Engler finally got his first win as a professional starting pitcher. The Spokane Indians righty overcame a shaky first inning, and for the second straight night his team offered up more than enough early offense in support. 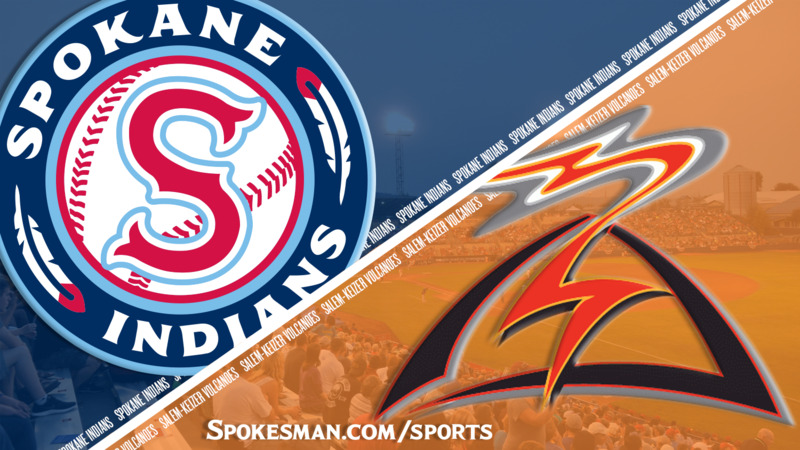 The Indians beat the Salem-Keizer Volcanoes 10-2 on Friday, taking the second of their five-game series at Avista Stadium. Engler (3-6) went five innings, ceded two earned runs and struck out seven for his best start of the season. He had been effective out of the bullpen early in the season, earning two wins in relief in June. But since joining the rotation Engler’s control had been inconsistent and his run support not nearly as robust as it was Friday. Volcanoes left-handed starter Seth Corry (1-1) was making his first appearance against the Indians this year, so Holmberg said he opted to lead off with Jax Biggers rather than J.P. Martinez. That gave Martinez, a lefty himself, a chance to get his timing down before stepping into the box. What they all saw was a pitcher who was struggling with his control for the first time this season. Batting 1-2-3, Biggers, Martinez and Curtis Terry combined to go 3 for 11 with four walks and eight runs. Nine regular-season games are left for the Indians (16-13), who remain a game behind North Division leader Vancouver (17-12). The Volcanoes (13-16) started the scoring just three pitches into the game. Kyle McPherson whacked a leadoff home run to left, and three batters later David Villar brought in Diego Rincones with a left-field single. But Engler struck out the next two batters to end the inning. He scattered three more hits over the next four innings. The bullpen handled the final four frames without incident, combining for six strikeouts and just two hits. The Indians answered with three runs in the bottom half despite not registering a hit. They took four walks – scoring on one of them – and picked up the others on a passed ball followed by a sacrifice fly from Tanner Gardner. Corry, touted as a top-15 prospect for the Giants organization, needed 38 pitches to get through the inning. Starling Joseph led off the Indians’ second inning with a solo home run to right to make it 4-2. After Biggers and Martinez walked, Terry singled to the opposite field, scoring Biggers. The throw from right was cut off, though, and the Volcanoes had Martinez caught between second and third. Meanwhile, Terry was well past first base himself. But, crucially, Martinez ran out of the pickle and dove safely into third past a tag, and Terry hustled to second. That kept alive the rally and ended Corry’s night. For the second straight game the Indians forced the Volcanoes to turn to their shaky bullpen early, which allowed two more runs in the inning. The Indians led 7-2, having drawn nine walks and slugged just two hits. The Indians got their bats going in the third. They strung together five singles to score three more runs and push their lead to 10-2. The rout was on again. By night’s end, every Indians starter had a hit, except Martinez, who still managed to get on base twice and score both times. Terry scored three runs, tying him with the Volcanoes’ McPherson at 46 for the Northwest League lead. In the past two games, Spokane has batted 30 for 73 (.411) as a team and scored more runs (28) than in the previous eight games combined (23) – good timing for a team chasing a postseason appearance. Published: Aug. 24, 2018, 10:54 p.m.